I love pancakes. But I don’t love how they can sometimes leave me feeling like I just ate an entire loaf of bread. Do you ever feel that way? This must be a symptom of getting old(er). But we can fix that. One grain that doesn’t leave me feeling sluggish is oats! That’s why I’ve based this pancake with oat flour instead of all purpose, because it’s healthier. For starters, 1/2 cup of oat flour has 80 fewer calories and 20 fewer grams carbohydrates than 1/2 cup of whole wheat flour. They’re also high in iron, magnesium and fiber, and contain the amino acid lysine, which promotes replenishment of body tissues like muscles and nerves – this makes them an excellent food staple for fitness junkies. Oats can also help lower cholesterol levels and help us feel fuller longer. Seriously, super power food in the house. 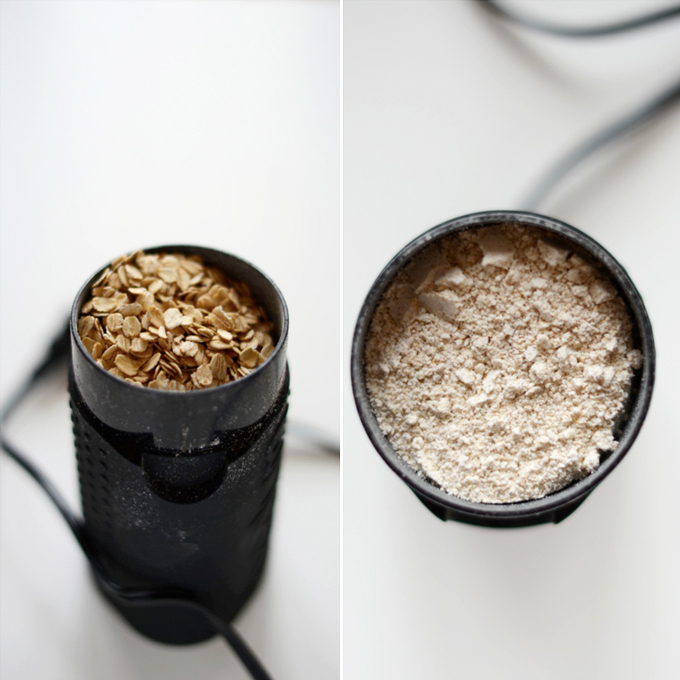 To make oat flour you simply process oats in a coffee grinder until a fine powder remains. You can also buy it at the grocery store (gluten-free optional) or make a big batch at home and store it in your pantry for quick mornings breakfasts like these pancakes. These pancakes are so simple to make: Just 1 bowl and 15 minutes required. You could even make them with other nut butters if you have a peanut allergy. More importantly they’re fluffy, filled with good-for-you ingredients, and packed with some serious peanut butter flavor. I topped mine with a little peanut butter sauce (just peanut butter whisked with very hot water) and a little maple syrup. But they’d also be great with sliced bananas, honey or jam (hello PB&J). These will definitely be my new go-to pancakes since I always have the ingredients on hand and they’re perfect even for busy weekday mornings. So excited to share these lovely cakes with you. Hope you enjoy. 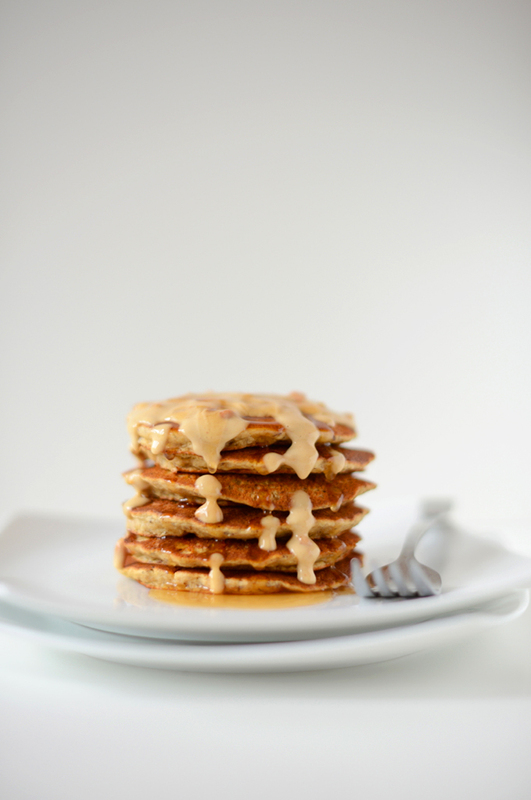 Fluffy peanut butter pancakes made with flaxseed and oat flour and sweetened with agave nectar. Wholesome, satisfying, and 100% vegan. Preheat electric griddle to medium heat (or about 350 degrees F / 176 C), or a large skillet on the stovetop. You want the surface to be hot but not screaming hot – oil shouldn’t smoke when it makes contact with the surface. Lightly grease your griddle and pour scant 1/4 cup measurements of the batter onto the griddle. There should be 6 pancakes (as original recipe is written). Flip when bubbles appear in the middle and the edges turn slightly dry, being careful not to burn. I loved this recipe. I used my food processor to make oat flour from my oats and it worked out perfectly. The only thing I would say is that the batter was really thick and did not make six 1/4 cup sized pancakes. I would add a splash more almond milk next time. I topped it with some melted crunchy pb mixed with maple syrup. My family went wild for these pancakes. I did sub out the wheat flour for GF flour and they turned out perfect. I also used 1/2 almond milk, 2 TBSP of peanut butter, 1 TBSP agave nectar, 1 tsp melted butter to make a thin sauce to drizzle over the top. I topped with sliced bananas and crushed walnuts. Love love love all your recipes! These pancakes turned out perfect! Even better than a boxed mix I bought at Whole Foods. I was Vegan before college, and I just went back to being Vegan again several months ago and I love your recipes! I’m not big on the store bought substitutes because they’re not quite “healthy” which is why I love your blog because you create simple, easy made-from-scratch recipes that make me enjoy being a Vegan. I don’t miss dairy when I make your dishes, and I’ve made them for family and friends who aren’t Vegan and they rave about them! My dad is a diabetic and I’ve encouraged him to implement more of a plant-based diet for his health and your recipes have turned him into a believer. You are so very talented, thank you for sharing your gift and creating such an incredible blog! My pancakes fell apart while making them. I don’t know what I did wrong. I followed the recipe and instructions. Do I need to use the correct ingredients? What I’m saying is do I need pure vanilla extract or can I add any vanilla extract ? Am I able to substitute a different type of flour than the oat flour? Thank you for this delicious recipe! I used hemp milk which is what I usually have on hand. The peanut butter adds richness and flavor! I also added some carrot pulp from my morning juice. Would this recipe still work if I added some vegan protein powder to it? Am desperate to find an easy vegan protein pancake recipe that I can make up a batch of. Have had so many disasters trying in the past… in fact 2 recipes completely failed just this morning! Hope you can help, all of your recipes I have tried have worked splendidly! Hi Lotte! Yes you can, up to 1 scoop! This is my go-to recipe for pancakes! I’ve been baking and cooking since I was about 7, so I have nearly 30 years of experience in the kitchen, but for some reason I always have a problem with pancakes. They’re too flat, too fat, overcooked, undercooked, you name it…. even if I follow the directions or use a mix! I should note, that I tend to stray from the original recipe whenever I’m in the kitchen (even if it’s one of my own creations), but when it comes to pancakes, I stick to what’s already been done. If anyone out there is contemplating this recipe, go make the pancakes…NOW! This is the one pancake recipe that has not stumped me in the kitchen. Not only are they easy to make, but they are also perfectly fluffy, full of flavor, and RIDICULOUSLY DELICIOUS! Best. Pancakes. Ever. Followed the recipe as posted-Very easy to make, fluffy, great tasting. Definitely a keeper and I will be make my again! Thank you!! This recipe is amazing!! Turned out great, topped them off with more almond butter, banana and your “Nutella” recipe. So good!! Wow the pancakes were really good. I was a little skeptical at first because I’m used to the regular pancakes, and my son was complaining when he saw how I was making them but as he was eating all I heard was mmm good. I added 1/2 cup of coconut sugar instead because that’s what I had and it’s delicious without the sugar crash. We loved pancakes and will be making again! Thanks! Hi Meg! I haven’t tried it with this recipe but think it should work! Could this be made by omittin the peanut butter and adding say, cocoa powder, instead? These are SO SCRUMPTIOUS. Kind of ate the entire batch (made 6 pancakes for me) ? Definitely play around with toppings, banana and chocolate chip are amazing with this recipe. Bravo! OMG! I have died and gone to heaven. These are A M A Z I N G, thank you! Made non-vegan version with normal egg and butter. More peanut butter, sliced banana and drizzle of maple syrup to finish it off. YUM! This recipe was what I googled and first found the website with (lucky for me!). Great recipe. My favorite is to sub coconut oil for the butter, but I’m not using solid fats anymore so even with canola oil this works well. I’ve also made it several times without any flower and added more oat flower and flaxseed and that is great also. I like to up the peanut butter quotient in the batter. For topping peanut butter, a little water and rip banana mashed together is amazing. I have made these several times and love them. I’m just curious, has anyone made the batter and let it sit overnight in the fridge or freezer? How about made the pancakes the night before and then heated up the next day? I am not a morning person so putting all of these things together first thing in the morning is not my forte. I am a night owl and would love to prepare everything the night before, but I hate soggy, not-so-fresh pancakes. Will the batter sit overnight well? Hi Tyler! The fridge should work! I would not suggest the freezer. Good luck! I had to leave a review because I’ve made these twice and they are now my favorite pancake. I always have oat flour on hand but not whole wheat so the first time around I sub’d in almond flour (and admittedly too much because even though I knew better why leave only a couple Tablespoons in the bag, right?). While the flavor was still awesome they didn’t quite set up before I had to flip so I ended up with a bit of a messy cake (learn from my mistake). The next time I used GF flour in place of the whole wheat and they turned out wonderfully. When I replenish my ww flour I’ll try it with no subs and I’m sure it’ll be perfect. Thanks, Dana, for this delicious recipe. Thanks! I love peanut butter and pancakes. Yummy! This is my first recipe using flax eggs and almond milk. It turned out great! I even quadrupled the recipe so I could have pancakes for days. Just made this pancakes! Followed your oat flour instructions also… I LOVE it!!! Thank you!!! Wow, I made these on a Sunday morning and these are absolutely delicious! I am still in disbelief that these are healthy. I’ve never made pancakes with oat flour before, but now I am never going back to regular flour! I also made the flax egg for the first time, and was skeptical at first, but it worked out just as well or maybe better than the chicken egg. Genius! These are so light and yet the peanut butter gives these little cakes a decadent taste. I’m in love…with these…pancakes….! I love the way they tasted and how fluffy they are, but I was bummed because no matter how much oil I put on the non stick griddle, they stuck and it turned into a huge mess. So I pretty much ate pancake crumbs for breakfast. Any ideas on how to prevent this? When I made these I added more non-daily milk than the recipe called for, probably close to 3/4 cup. The flour and maybe the flax absorbed the liquid so I had to keep adding more to thin out the batter. Maybe that would help? Do you have the weighted measurements for the flours? I had some oat flour in my pantry, so I did a Google search for oat flour pancakes. This is the recipe that I pulled up. I had all of the ingredients on hand so decided to make them. I used one egg instead of the flax egg. These were very delicious and filling. The only thing I missed was bananas. I love bananas with this whole oat/ peanut butter combination. I was sadly out of bananas! I topped the pancakes with walnuts and syrup. It was very satisfying. Looking forward to making them again when I have bananas in the house! Thank you for the recipe! This is a great recipe! They came out perfectly fluffy and tasty. I wish my conventional pancakes came out this fluffy!!!! Best pancakes ever!!! I love this recipe! I used banana instead of butter…. Great taste! Yum-mee! The texture was soft but they did burn easily. Almost burned a few! It must have been due to the honey. I made a few subs. Used dairy milk, coconut oil, honey and buckwheat flour in place of almond milk, Earth Balance, agave and pastry flour. Trying to finish up my Reese’s peanut butter spread so that I can start making my own peanut butter. Thank you Dana! Can I make these leaving out the pastry flour?? THIS. This is LITERALLY (and I am not liberal with that word) the BEST pancake recipe I have ever made/tried/experienced. I don’t make it the vegan way, but my goodness. All my allegiance are belong to you. Can I buy a sixth star to give?? Hello, this recipie looks wonderful. I’m always trying new ways to make pancakes. I have a concern with your oat flour carb claim. I checked my packages of oat, buckwheat, whole wheat, etc, and they are all about the same total carb. This could be misleading for some whom watch their carbs. Made these this morning, and it was a big hit with the family! 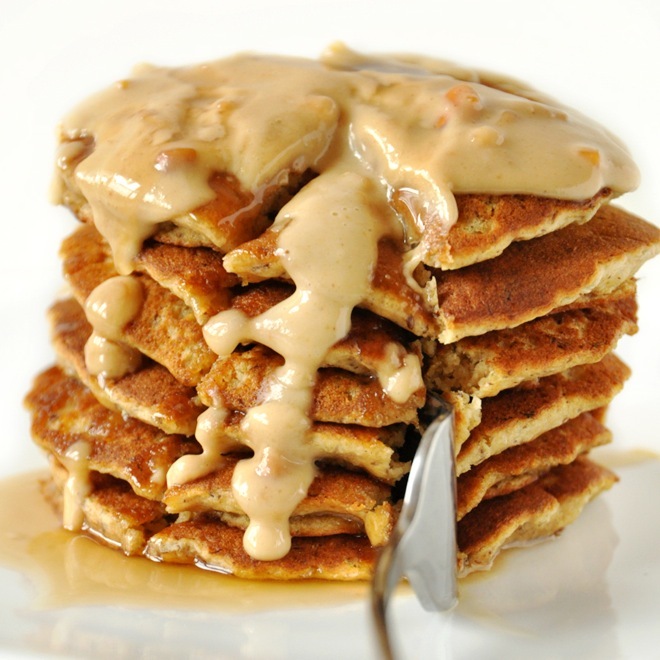 Topped with sliced bananas and the peanut butter sauce, so yummy! I just made these with PB2 with chocolate. AMAZING! I just have to say – I never usually comment on these things but I just wanted to let you know how AWESOME this recipe is!!! I was looking for a way to use up baby cereal (he is past that stage and into finger foods now) – the recipes I found were so rubbery and blah. I did a search for oat flour pancakes and these were at the top of the list. I am super crushing on your recipes! I have been eating these pancakes every day since I found the recipe – baby likes them too. I used baby gourmet tasty smooth oatmeal for the oat flour and this morning I tried the baby gourmet ancient grains blend – they turned out amazing. I love how versatile the recipe is (variations I used were: chicken egg, goat milk, coconut oil and baby gourmet cereal). LOVE LOVE LOVE! Ah, thanks Mary! So kind! Glad you enjoyed them. Thanks for sharing! Wow! This recipe was awesome! I am gluten free & diabetic and I wanted to change my routine from just eggs or oatmeal and this definitely hit the spot. Of course it wasn’t as fluffy as normal pancakes but the taste totally made up for it, it was really good. Am i able to make a batch of batter the day before so its is ready to cook the following morning? Yes! I think that’ll work! Yet another one of your recpies that I MUST try! Tried it! — I usually have trouble with pancakes, but these were perfectly fluffy, and tasty even without any toppings! Although I did add some of that peanut butter syrup with a blueberry/blackberry mix heated up with a bit of agave. I’ll probably eat the leftover ones with some banana slices. This may become my go to recipe for pancakes as well. Thanks for all the delicious food ideas, and for helping to make my transition to a vegan diet easy and fun!!!! Mine turned out way too thick and quite dry. Any suggestions? Otherwise, delicious! 4 stars since it was probably human error! Maybe your peanut butter wasn’t natural? Next time, use peanut butter with just salt and peanuts. And if needed, add a bit more almond milk! These pancakes have the potential to save lives. Seriously. Had a crazy day. The kind that makes murder seem plausible (only for a second, people–calm down). What could possibly make all things right in the world again? A bath? Yoga? Nope. The answer today was these pancakes for dinner. Simply amazing. I used almond butter, just oat flour, and topped with sliced bananas. Thank you for helping me to get back to my happy place! All hail Dana and this amazing pancake recipe! Sunday morning pancakes just got a little bit more awesome! These pancakes are amazing! I am gluten, dairy and egg free and this is the first pancake I have found that actually tastes decent. I love your site and I look forward to making more of your recipes! How much all purpose flour should I use to replace the oat flour and whole wheat flour? That’s all I have >< THanks! Equal amounts. Whatever flour amount I recommend, you can sub 1:1 with all purpose. Tried these for breakfast today, and they were great! Loved that they were quite filling compared to a white flour pancake. And being without a non-stick fry pan, i was happy to see these work out well on my cast iron. These are so lush! Have made them so many times now :-) I used all oat flour though and they turned out fine. These are a new favorite!! I’m making them for the second morning in a row, and my son and I are scarfing them up again. I replaced the whole wheat flour with flaxseed meal, the butter with olive oil, and the almond milk with coconut milk. And I doubled the recipe. Pinning this now! Thank you so much for such a phenomenal recipe! I have now made these three times. They are great! THANK YOU!! 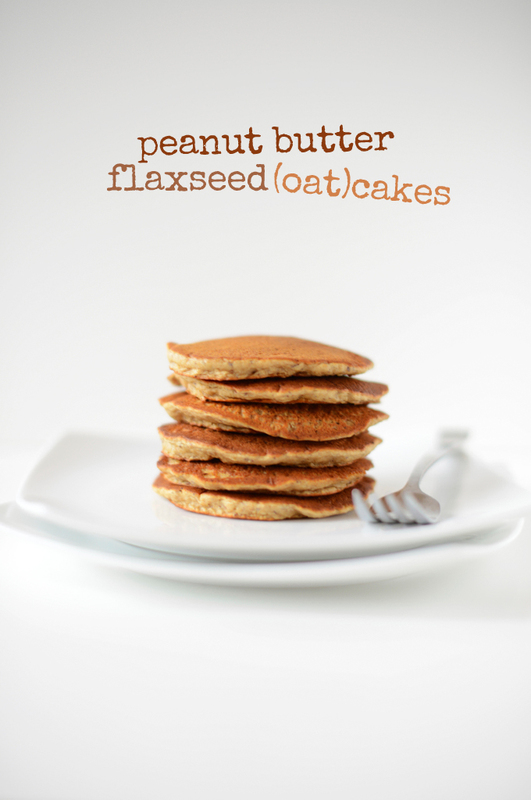 Ohmygoodness, just made these and added in a banana….holy pancakes. So amazing! Just made these. They were delicious! The pancakes were not large, but they were really filling and definitely enough for two people. I used canola oil instead of Earth Balance. Thanks for the recipe! I made these with all oat flour and they still turned out fine! thank you for sharing this recipe its now my new go to pancake recipe! The pancakes were amazing! Hot from the pan and soaked in maple syrup…irresistible! Thank you so much for the 5 star recipe. I’ve been wanting to do homemade pancakes forever! These were perfect for my snow day, a nice switch from my usual stovetop oatmeal. Proud to say I finished both servings by myself! However I did thin out the batter a bit with some water, because I usually can’t finish pancakes that are too heavy, and lessened the honey as I can’t eat super sweet stuff in the morning. Still turned out great! Great way to get lots of healthy calories in the morning. Thanks so much! 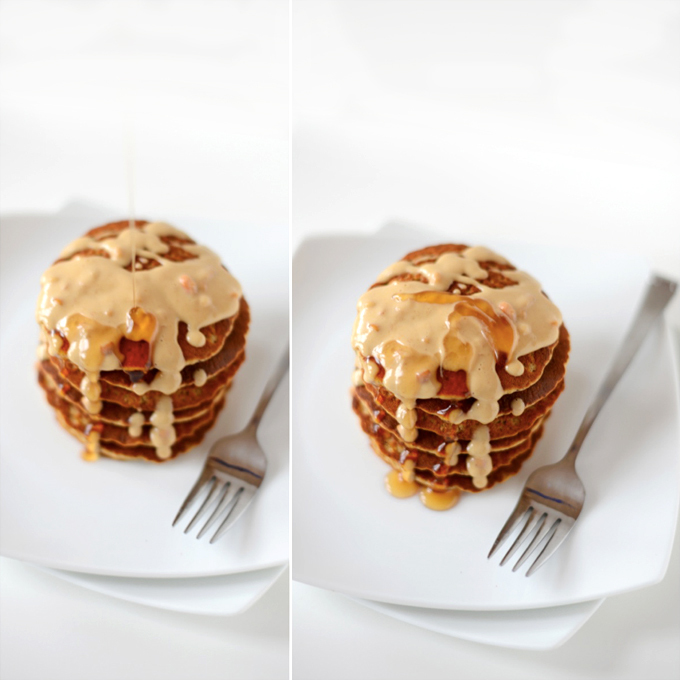 I love peanut butter and I love pancakes so this recipe is a win for me. I do have one question about making oat flour. Does it the type of oats use matter? Would quick oats work? quick oats would work fine! Just found this recipe on Pinterest and am excited to try it out. However I have a question……would gluten free flour work in place of using whole wheat pastry flour? You mention using gluten free oats but then saw the whole wheat flour and that through me. Any helpful tips would be greatly appreciated! I think a GF flour would work on these. If you give them a try, let me know! Excited to find the question and answer I was looking for!!! Making these for dinner right now. This recipe is a God send. I had been worried all day about what I was going to make for breakfast tomorrow, and as I got onto Pinterest, I found this pin at the top of my feed. I had everything in my pantry for this and went to work. (I work at 5 am so I always make my breakfast the night before). These are delicious. Thank you. Peanut butter pancakes for breakfast! Yay! I love everything about this. The styling, the ingredients (oat flour! ), and the toppings. Thanks for sharing Dana! *by kids I mean me. I am my kids. Just waffle-ized these for breakfast. We’re not vegan, so I did use butter in place of the Earth Balance, but kept the flax egg. Delish w/ a few slices of banana and an extra drizzle of maple syrup. Doubled the recipe, so we’ll have extra for tomorrow. Thanks! 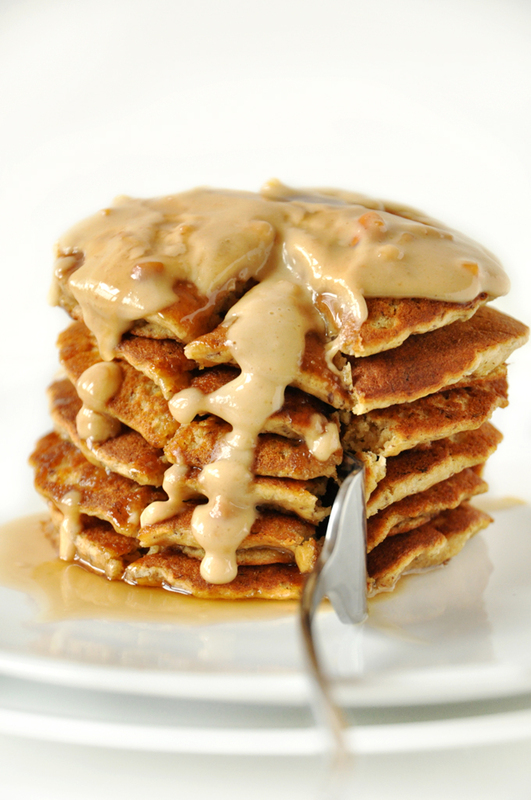 anything with peanut butter is indeed a winner already :) I HAVE to try this sometime…soon. These look like pretty much my perfect pancakes. I cannot think of anything better than peanut butter and oats. Yum! They look incredible and remind me of a 2009 recipe I have for banana-flax-oat-PB vegan pancakes. My photography wasn’t exactly pretty back then and I should remake those. I love the PB drizzling down the sides of your stack! 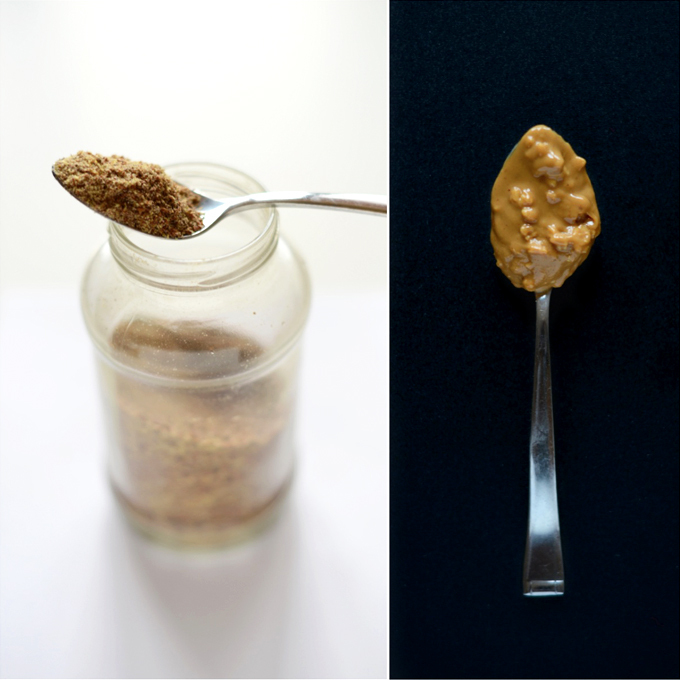 Thanks for providing a recipe that incorporates two of my favorite foods in the world – peanut butter and oats. I can’t wait to try them with more peanut butter and sliced banana! Thank you for this amazing recipe! I am a vegan and my husband is a “sometimes vegan” lol so lets say its pretty hard to please him but these i think will do the trick! my daughter and I are allergic to peanuts so I will use almond butter and see how it works! I just did- use almond butter. Baby is two yrs old next month so holding off from peanuts till then. But, we both love! Eating them right now. Can’t wait to try with PB. Hubby will love these as well. Thank you for this delicious looking recipe! I especially appreciate the nutritional info since my husband was recently diagnosed diabetic. We’ll try these for breakfast this morning. I adore pancakes and hate the loaf of bread feeling as well. These look incredible and are definitely worth a try! i’ve been making your chocolate chip oatmeal pancakes pretty regularly since you posted that recipe but i might need to switch now because, oh my goodness, these look amazing……! 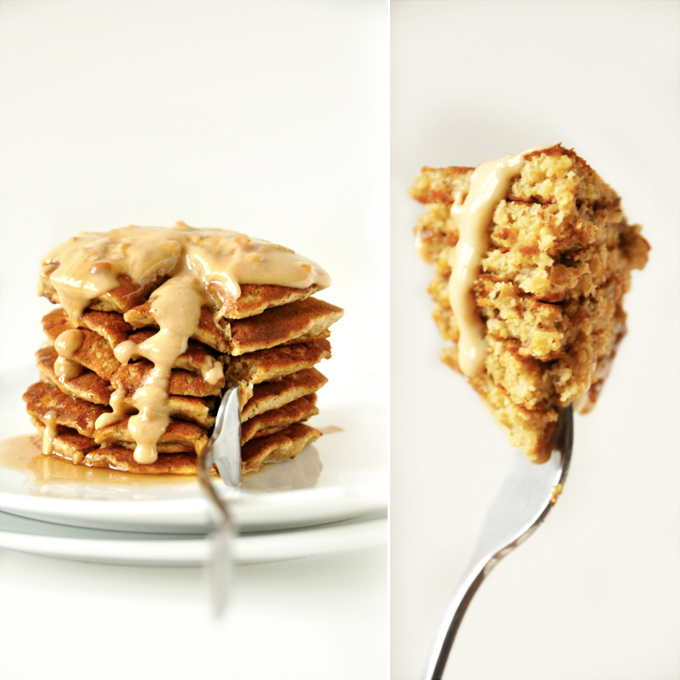 I love baking with oat flour and can almost smell these pancakes!